In celebration and activism of Global Entrepreneurship Week, TiisetsoMaloma.com in association with The Hope Factory, ACM Gold, WEY (Woman Emancipate Yourself) and eKasi Entrepreneurs, bring you Startup Picnic. A fun-filled day connecting young entrepreneurs, business minds across different backgrounds, to unwind, play games and have fun while making friends and building business relationships. Startup Picnic will attract various entrepreneurship activist persons and organisations: angel investors, venture capitalists and incubators. Global Entrepreneurship Week started with an idea of inspiring people everywhere to unleash their ideas and take the next step in their entrepreneurial journey. 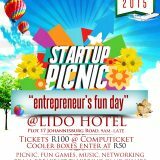 Startup Picnic brings together entrepreneurs and aspiring ones under the sun. The day’s theme goes like: breakfast talk with guest speaker Irfan Pardesi, music, braai, drinks, delicious food, exhibitions and entrepreneurs experienced with failure and success to casually consult from. Come and join us on the 22nd of November 2014 at CSIR Sports & Recreation Club in Pretoria from 9 am till 8 pm. Tickets are available at Computicket @ R70. Expect fun games like sand volleyball, water polo, 5 aside soccer, sack racing and other garden games. The breakfast talk is between 10 am to 12 noon. Dress for fun. Picnic baskets and cooler bags are allowed. We urge cans where possible. Braai stands and charcoal will be provided. No alcohol will be sold at the event. Our sponsor, The Hope Factory has developed more than 1000 South Africans over the past 11 years. Acting as an Enterprise Development enabler, the ultimate aim is to develop, equip and support previously disadvantaged South Africans. They provide extensive mentoring and support programmes so that enterprises are set for success. “From the 17th -23rd November, we are joining entrepreneurs across the world to commemorate Global Entrepreneurship Week (GEW). We have picked events where we’d like to add value by assisting start-up entrepreneurs succeed in their ventures. This is what Global Entrepreneurship Week is all about – to bring ideas to life, drive economic growth and expand human welfare,” says The Hope Factory’s CEO Annie McWalter. There will also be startups to corporate exhibiting which include, Skinny Sbu Socks, FRQNCYSA, 30 of The Hope Factory mentored businesses, Nedbank and many more. The breakfast talk guest speaker Irfan Pardessi, is an avid entrepreneur born in Pakistan but now settled in South Africa, is the co-founder of ACM Gold and a tech-startup investor. He made his mother proud by taking ACM Gold from 22K USD, without funding or financing, to a group valuation of over $450 million. The other speakers are, Busta Madiba, an experiential marketer and founder of Gushima Events & Productions, and Puseletso Modimogale, a businesswoman, WEF (NGO) founder and business mentor at The Hope Factory.